Cindy Bowler's "Trust" is burned onto a piece of cherry. Jason Alden's painting "The Queen"
Cynthia Parker Houghton's "Closer" is a fabric wall hanging. Kay Curtis's playful "George" references both of February's holidays. "Matters of the Heart," a Valentine-themed show by twelve local artists, is featured this month at The Works bakery and café at 118 Main Street in Brattleboro. 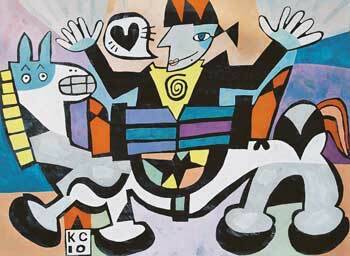 Kay Curtis asked her colleagues to make art using a literal or metaphorical interpretation of the heart motif and invited them to contribute a statement about how they see themselves as "remarkable." Curtis is currently participating in Landmark Education's Power and Contribution course in San Francisco (5 weekends over 10 months). One outcome is for participants to reorganize their lives around making an impossible promise to the world. Representing a coming together of her interests in art, education, and advocacy, Curtis sees this exhibit as the launching of her own impossible promise: "I was clear that my promise would be that everyone would know their own and each other's greatness. I created a Manifesto in the spirit of art manifestos from the past that could be read as part of the event." Manifesto of Remarkability - We hereby declare: All people are remarkable. By experiencing fully our own greatness and recognizing the greatness of others, there will be an end to the personal and global suffering caused by fear, greed, jealousy and anger. JULIE WATERS has contributed the photographic image "Sandhill Cranes, crossing beaks." She "hears music" in her photographs and "see images" when she plays the guitar. "I can not help but notice the patterns that tie them together." Scott Nelson's evocative, colorful "Heartland"
ELIZABETH DENNY constructed "Put Your Heart Into It," a sculpture made using metal parts including a clothes dryer. "She ... irritates the neighbor across the street, who views her as an abomination. This of course makes her all the more appealing (to me)." CYNTHIA PARKER HOUGHTON has created a fabric and pencil hanging entitled "Closer," depicting two trees entangled in a dance. About her greatness she writes, "I move walls and doors in my house like moving the furniture. I always have another plan percolating." 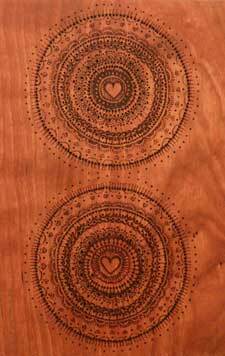 CINDY BOWLER has created four works on wood ("Open Your Heart," "Wholehearted," "Trust," and "You Opened Up to Me." She shares, "I meditate and get lost in the obsessive qualities of mandala making. I love how the grain [of the cherry] dictates directions; I flow with it, and its softness allows for much detail." SCOTT NELSON has produced "Heartland" and declares, "I am remarkable because I made a sculpture out of bricks and toilet paper." ERIKA BENSON has constructed a papier-mâché heart she calls "Sewing the Seeds." "My lifelong love affair with making things resumes with the completion of this heart project [as] I have been on hiatus from art making for the last several years, and just having a creative task and deadline feels remarkable to me"
KAY CURTIS has two works in the show -- "Landscape of the Heart" is the piecing together of colored papers with sewing marks; the boy on the horse is "George" (Washington, that is). "I am remarkable because I never stop having another wonderful idea and I am easily able to see greatness in people." LISA, BARBARA & LILY CHARKEY have made "Collaborative Valentine," a three-generational creation. "We make art together all the time." JASON ALDEN brings a large oil canvas called "The Queen." 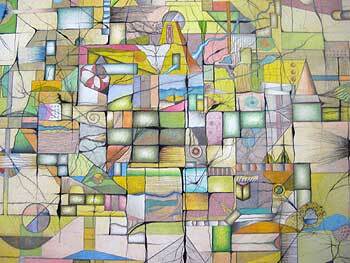 RANDY WALTON has two untitled pieces in the show and writes, "Staying in one spot has never been easy. I want to explore, see what is on the other side of the mountain. 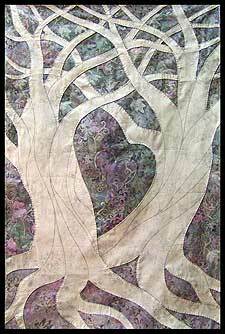 Trained as a printmaker, cutting, tearing, shaping my way to new discoveries brings endless joy and longing for more." The exhibit will be up through March 1 at The Works. 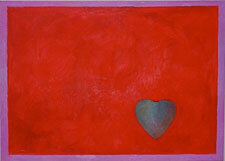 Featured young artist FIONA is showing her own heart-inspired works of art to complement "Matters of the Heart." Stop by and contemplate your own remarkability.